You’re on Get Well Quotes and Wishes, page 2 of 3. These sayings can brighten days when people need it the most. It can be painful when a loved one or a friend falls sick. Medicines and care will certainly play a crucial role in getting them back and well, but your love and wishes go a long way in making the person feel better inside. Giving someone hope and making them feel great has a big impact on speedy recovery. Your words can have a big influence on someone who is recovering from an illness. Here are some great get well quotes and messages you can send to a friend, loved one, colleague or a relative to help them recover faster. Humor may be hazardous to your illness. A bowl of warmth, a soft face, a new day. Some get-well thoughts sent your way. Feel better soon. Your never know how much they care until you are under the weather. Give yourself whatever gifts of time and rest you need to feel better – and know that you’re surrounded by caring thoughts and prayers and heartfelt wishes. Rest easy. Get well. I enjoy convalescence. It is the part that makes the illness worthwhile. Wishing that each day brings you renewed strength, brighter times, and a healthier, happier you. It isn’t always easy, but when you’re not feeling well…hope it helps to know others are thinking of you… and hoping that you’ll be better very soon. Take good care of yourself. as expectation of something tomorrow. built into folklore, common sense, and everyday experience. Love moves the flesh, it pushes matter around. has uniformly been recognized as a valuable element in healing. A Get Well Prayer—May the peace and comfort from God surround during your time of recovery. Get Well Soon. May God’s unfailing love and care surround you while you recuperate. I may not have a medical degree but I do have friendship’s healing touch. Get well soon! Thinking of you during this time of illness, and praying you will find strength in the Lord and his never ending supply of love. FRIENDSHIP, is the name of my powerful healing technique. I’m here now, to keep sickness at bay. In no time, you’ll be laughing and smiling away. May He bless your day today. There are brighter days that lie ahead for the child of God that puts their trust in Him. Praying for a very quick recovery. God Bless you as you heal in the coming days. Praying for you today, that you will sense God’s nearness to you and the certainty of His love for you. Get Well Soon! We heard that you were feeling a bit droopy, and wanted to send some thoughts and prayers your way. Get well soon! At no time, nor in any way, will God ever fail His Children. May God keep you in his care as you recover. Thinking of you today and praying that you feel the power of God in your life as you heal. I pray that he will bring you rest and peace as you get better. Hurry up and get the heck out of there! Sometimes I thought that you are some kind of invincible, but now I know that you are human too. Get well as soon as possible. You have a cough? Go home tonight, eat a whole box of Ex-Lax – tomorrow you’ll be afraid to cough. In case you’re wondering, I sent those flowers for the nurse, not for you! Just kidding! Hope you get well soon by seeing them! Enough of your drama, let’s go get ourselves drunk. Just kidding! Drink your medicines and follow what the doctor says. Get well dude! If money can buy back your health, I wouldn’t mind closing my bank account just to see you well again. Get well soon! Praying for your quick recovery. Get better soon or I’ll break your legs again. Just kidding dear, get well soon. Your absence cannot be tolerated anymore, because I don’t have anyone to fight now, so get well soon! Wishing that each day brings your renewed strength, brighter times, and a healthier, happier you. Get well soon. to get you well again. We are so eager to have you back with us. Arise and shine and bounce back to life. We wish you quick return to health. When you are sick I miss the fun and laughter. Get well soon. Wishing you a fast, easy recovery and perhaps some bright cheeriness as I send love your way. I miss you. Please get well soon! Sending sunshine to brighten your day. Get well soon my dearest friend. You fit as fit can be..
May you enjoy this time off to put your feet up and recover fully. We hope that the next few weeks are filled with lots of rest and relaxation. and so am I with you NOT around. the swing of things real soon! I am not a doctor so I don’t know how to bring an end to your illness. But I am your friend so I know how to bring smile on your face. Feel better soon friend! Heard That You’re Not Feeling Well. So Brought Flowers For You To Make You Feel Healthier And Happier. Feel better soon! I checked your doctor’s prescription and it was lacking the most important medicine of all – the company of a BEST FRIEND. Health and good humor are to the human body like sunshine to vegetation. For life is not to live, but to be well. Sending good vibes to you, my dear friend, to help fight your sickness. I hope you feel better soon! A smile, a puppy, the rainbow after a storm; some happy thoughts sent your way in hopes that you feel better soon! Tip: These get well quotes works nicely for photo captions on social media at sites like Facebook and Instagram. No one wants to see you like this. We are missing the happiest person at the office. Get better soon! This is a perfect time for you to take a rest and worry not. Get better soon! I was thinking of you last night. Hoping that you are well taken care of by your doctors. I cannot wait to see you again. Get better soon! Healing is upon you. We cannot wait to see you! I’m sending you warm healing wishes. I hope you can feel that warmth and can imagine it traveling through your body ushering out all the bad guys. Get better soon! Waiting patiently but eagerly for you to come back with your great sense of humor! Get better soon! Little flowers are blooming and telling you to get well soon, so listen to them! If just knowing that someone cares about you helps the healing process…then you should be feeling better already. Get better soon! Drink lots of fluid and eat lots of food and get lots of energy and rest to recover even sooner than you ought to! Get better soon! We know you will overcome this kind of situation. There is nothing we ever wanted right now, but your healing and fast recovery. Get better soon! 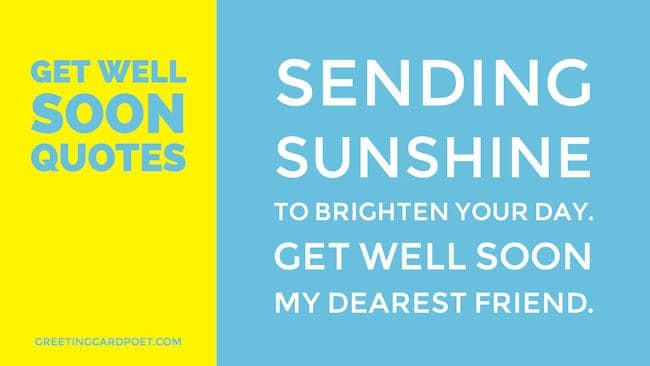 Get better soon and return to your home to decorate it again with your cheerfulness and brightness! Get better soon! If you have suggestions for our get well quotes and messages, please let us know via our Contact page. Thanks.